Co published with Oxford University Press. A volume in the IEEE Press/OUP Electromagnetic Wave Series. Gain a thorough understanding of one of the most important simulation tools in computational electromagnetics with this comprehensive introduction to the TLM method. Chapter 1: Introduction to Numerical Modeling. Modeling as an Intellectual Activity. Electrical Circuit Analogs of Physical Systems. Chapter 2: Transmission Line Theory. Transient Response of a Line. Sinusoidal Steady State Response of a Line. Dispersive Effects in Discretized Transmission Line Models. Chapter 3: Discrete Models of Lumped Components. `Link` and `Stub` Models of Capacitors. `Link` and `Stub` Models of Inductors. Examples of Mixed Link and Stub Models. Chapter 4: One Dimensional TLM Models. 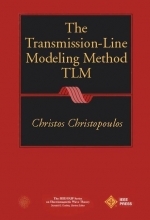 TLM Model of a Lossy Transmission Line. TLM Models for One Dimensional Electromagnetic Problems. Study of Dispersive Effects in One Dimensional TLM Models. Chapter 5: Two Dimensional TLM Models. Dispersion in a Two Dimensional Mesh. Chapter 6: Three Dimensional TLM Models. The Development of Three Dimensional Nodes. An Alternative Derivation of Scattering Properties. Chapter 7: The Application of TLM to Diffusion Problems. Applications of the TLM Model of Diffusion Processes. Chapter 8: TLM in Vibration and Acoustics. Chapter 9: Application of TLM to Electromagnetic Problems. Chapter 10: Special Topics in TLM. Frequency Domain TLM (TLM FD).